Force Factor BRX Review – Does it work? Have you ever taken pre-workout supplements? Back in the day, pre-workout supplements are virtually non-existent. Coffee, water, and a banana was all you need to get the energy and push you need to work out. Now, almost everyone – from endurance athletes to bodybuilders – use pre-workout supplements to help them make the most out of their time working out. The typical formula for pre-workout supplements is simple – stimulants plus nootropics. Stimulants help your body burn energy more efficiently, while nootropics help you get into the right mindset to endure more intense workouts. That’s what Force Factor BRX is trying to accomplish. BRX claims that it can give you the right push combined with the explosive energy you’re expecting out of a pre-workout supplement. Force Factor BRX’s main ingredient is creatine. There are many creatine products on the market, and each with their own individual formulas. However, creatine is not a staple ingredient in pre-workout supplements. The main function of creatine is to supply your muscles with an explosive energy to boost your performance during workouts. Creatine is not meant to be taken in pre-workout supplements. In fact, many experts say that you should take creatine post-workout. Based on my experience with creatine, it doesn’t matter when you take it, as long as you take at least 5 grams a day. Still, the main component could’ve been interchanged for something more useful for a pre-workout supplement, like nootropics. 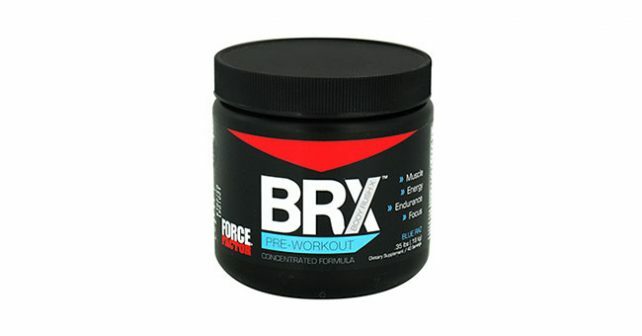 Who uses Force Factor BRX? Based on my personal experience and with the people I’ve encountered, creatine supplements like Force Factor BRX is typically used by extreme performance athletes and those who are just new to intense workouts. Starters, as I’d like to call them, pretty much would like to get their hands on anything that would help them work out and creatine is an obvious choice for them. The real benefit of creatine is with high intensity workouts, since it increases your capacity to overload, which doesn’t mean much when you’re just starting out. Force Factor BRX is an interesting mix of ingredients. Creatine Monohydrate is the dominant product in BRX. Beta Alanine is the ingredient that holds it all together by increasing muscle endurance by blocking lactic acid buildup. It also contains a mild dose of caffeine, B-vitamins to help boost your energy levels, and N-Acetyl-L-Carnitine to increase muscle pump. Aside from these main ingredients, Force Factor BRX also contains Vinpocetine, which acts as a mild vasodilator and nootropic, and Huperzine, which is also a mild Nootropic. While packed with ingredients which can help boost performance, the mixture itself is odd. Some manufacturers say that loading on Creatine Monohydrate at least 5 days before you do intense workouts would increase the amount of energy stored on your muscles. However, since it is combined with several kinds of nootropics, it might not be the best idea to load on creatine using Force Factor BRX. It’s commendable for Force Factor to focus on the content, rather than drown the formula in a sweet Kool-aid like mix. Force Factor BRX blue raspberry tastes OK, but not remarkable. It would be a nice alternative for people who are looking for a good product without having all the unnecessary flavoring just to make the product more palatable. Creatine plus Beta Alanine makes total sense. It increases your energy levels, and it decreases muscle fatigue. The caffeine effect is also mild, but still effective nonetheless. The pros of BRX are limited to Focus and Endurance. If you’re looking for huge muscle pumps, don’t expect much from BRX. Its carnitine ingredients may not be enough to satisfy you. BRX is a solid product. The good thing about BRX is that it leaves room for you to stack BRX with other supplements. The best muscle building supplement you can take with BRX is NitroGenix elite. It boosts strength, energy, and it also gives you more muscle pump, which is what BRX lacks.